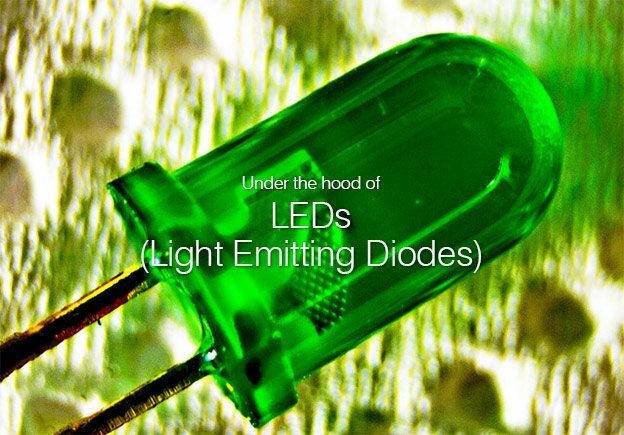 LED lamps, or Light Emitting Diodes, are becoming more and more common. Having been used for some time in products such as digital watches, remote controls and brake lights, they are now being seen in many more applications such as HD TVs, and as replacements for standard incandescent bulbs in offices and houses. LEDs do not have filaments, and so do not get as hot as incandescent bulbs; as there is no filament to burn out, they also last much longer. Because they are very small, they fit nicely into electronic circuits. But how do they work? A diode is a semiconductor, which is a material capable of conducting electricity. The conductor material generally used for creating LEDs is called aluminium-galium-arsenide. This has additional atoms added to it (doping), thus making it more conductive. If extra electrons are added to the semiconductor it is called N-type material; this gives it extra negatively charged particles. The free electrons then move from a negatively to a positively charged area. If extra holes are added to a semiconductor it is known as P-type material, as it has extra positively charged particles. Electrons move between the holes, from a negatively to a positively charged area, meaning that the holes themselves seem to move from a positively charged to a negatively charged area. When P-type and N-type materials are put together, with electrodes at each end, a diode is created, in which electricity can flow in only one direction. If you do not apply any voltage to the diode, the electrons in the N-type material fill the holes in the P-type material, which creates a “depletion zone” at the joining point of the 2 layers. In the depletion zone a charge cannot flow, as all the holes are filled with electrons, and there are both no holes for free electrons to move to, and no free electrons to move. If you apply enough voltage to the diode, by connecting the N-type side to the negative end of a circuit (cathode), and the P-type to the positive end (anode), the free electrons move from the N-type to the P-type material, and the holes move from the P-type to the N-type material. This makes the depletion zone disappear and charge moves across the diode, creating light. How to create visible light? Light is made up of photon particles, which are released when electrons move. In a diode, when a free electron from the N-type material drops into a hole from the P-type material, energy is released as a photon; the greater the drop, the higher the frequency of energy released by the photon. When making infared remote controls for instance, the drop is very small, meaning that the photon frequency is very low, and the light created cannot be seen. So to create visible light, the drop needs to be greater, creating a higher frequency. The frequency of the photon decides the colour of the light produced. All of this means that LEDs create light very cheaply, and across the entire visible spectrum. In standard incandescent bulbs, up to 90% of the energy created is lost to heat, and in compact fluorescents that figure is 80%, but in LEDs, as there is no filament to heat up, nearly all of the energy created goes into producing light. It also means that LEDs can be used in situations where giving off heat would be detrimental to the application. 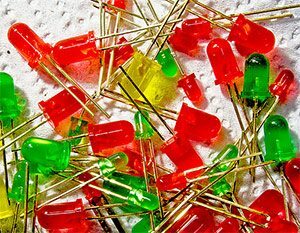 LEDs are also far more durable than incandescent bulbs as they are manufactured within epoxy resin, and as they are solid state devices, with no moving parts, they are much less likely to malfunction. As they have such long lives, use very little energy, and can be very small, they are proving more and more popular. I have worked in the electrical industry for 5 years for Gil-Lec, an international electrical wholesaler with over 25 years experience selling to both public and trade. This is a nice article, Paul. LED technology has really changed the lighting industry. In terms of life time and luminous efficacy what is the difference between LED lamps and compact fluorescent lamps for applications like street and house lighting?